Although we got up really early it took us some time to pack the bikes and have something to eat before we moved. We left Dharan at 6:45 am headed to UAE on the way we had a mix of weather conditions ranging from 32 to 43 deg. C, as well as rain and dust with gusty crosswinds that would at time sting as you were sand blasted. I also realize that in the heat you get tired much more quickly than if the weather was cooler, which explains our frequent stops that day. The tracker was also an issue since it was placed in the map compartment of the tank bag, and while riding it would get too close to me that the signal would get blocked by my body which led to friends calling and asking why we had stopped. 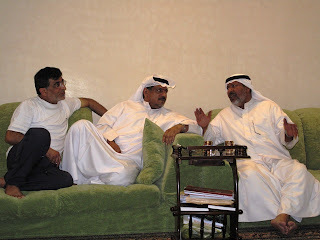 When we reached Abu-Dhabi, we were greeted by Ali's friend Mr. Ajeel, we followed him to his house, and met his sons and brother. They also prepared dinner for us at their house where we rested for a few hours talking about our trip. We then rode to Dubai, while keeping an eye on our fuel gauge since we needed to be on low fuel as a regulation for the bikes to be air-freighted. We arrived shortly after midnight at the hotel where we intend to spend 4 nights for shipping preparation.